Convergys VP, Market & Product Strategy Allyson Boudousquie explains the essential elements of ominchannel interactions present and future in this clip from SpeechTEK 2018. Learn more about omnichannel at the next SpeechTEK conference. 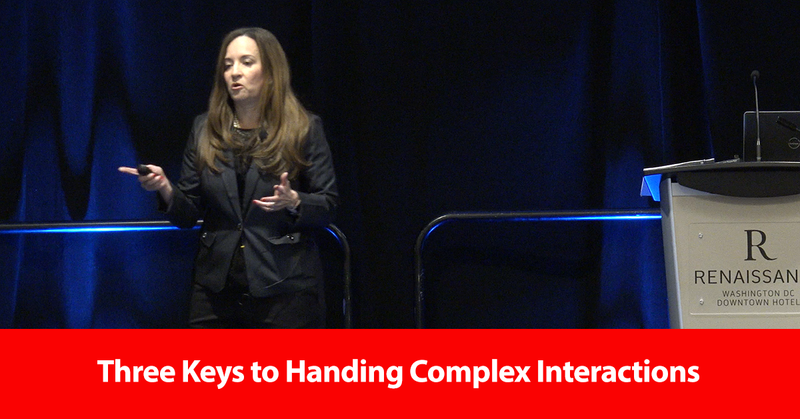 Allyson Boudousquie: For handling complex interactions of today and in the future, right, the three big takeaways that I have for you and the ones that we internally are focusing on are understanding and engaging. We've done a lot of analysis around our own demographics of our agents: What keeps them happy? How do you recruit them differently? Because you do, you have to. How do you keep them? How do you leverage digital tools? As we talk about all these great tools that we provide our clients, how do we take those and make those internal-facing so that we can machine-enable these agents to be more efficient and more effective? Things like RPA, internal type of a chatbot, knowledge management systems. How do you provide them with that omnichannel journey information that clients have as they're navigating all these great digital channels before they may go into an agent assisted or a voice interaction? We have to really look at redefining the skills and capabilities needed from complex and difficult work because the calls that are going into our centers today, and you probably know this yourselves in your own centers, in your own experiences, they're longer, they're harder. Because we're taking care of all the easy stuff. The calls are transactional in nature; we don't really get much of those anymore. People have learned to use their transactional chatbots, their self-service applications. They've learned how to do this. What we're getting is all the hard stuff. How do we make a difference with that?